It looks like BMW somewhere has the intention to carry ahead the amazing two-year saga created by the BMW 1 Series M. The reason behind we presuming this is their recent unveil BMW M2 2016, at the 2015 Frankfurt Motor Show. Defined with splendid architecture and engineering the model carries amazing looks. 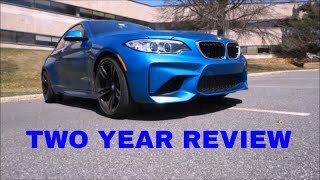 Let us have a look at the review of BMW M2 2016 to know in detail about it. The interior of BMW M2 2016 is driver oriented and comes with M-badged sport seats’ featuring adjustable side bolsters for better comfort. Not just comfort but they also look good being wrapped in black Dakota leather with blue contrast stitching. The same essence of leather and contrast stitching further marks entity over the steering wheel. The dashboard gets more enhanced look with the carbon-fiber inserts exactly above the glove box and little around the A/c vents located on driver’s side while the center console is drenched in carbon-fiber. Behind the three-spoke steering wheel with shift paddles is the instrument cluster with specific dials and needles and lessening the mess to offer better concentration. Talking about the tech integrations, the model has GoPro app and M Laptimer app making your experience sportier. 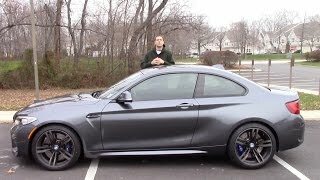 In all, rounding up the interior details of BMW M2 2016 I would say it is worth all the money and time. The exterior of BMW M2 2016 at first will look like the M4; however a closer inspection might highlight some changes. Let us start with the front fascia there is a M-badge over the traditional twin-kidney grille. The bumper gets a revised look and adds commendably to the aggressive looks. The major add-on is with the honeycomb pattern of grille, the sculpted aero add-ons and the massive air intake. Moving towards the rear end the look gets more muscular. You’ll notice horizontal lines highlighting the bumper and not to be forgotten those vertical reflectors that add impeccably to the overall appearance. There is also a sporty diffuser with quad-exhaust pipe arrangement. 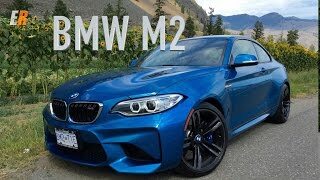 In all while talking about the exterior details of the BMW M2 2016 I would say, it is elegant, muscular, beefed up and sportive. Beneath the hood of BMW M2 2016 is a 3.0 Liter six-cylinder TwinPower Turbo engine generating total output of 365 hp and peak torque of 570 nm paired to either six-speed manual or optional dual-clutch automatic transmission. 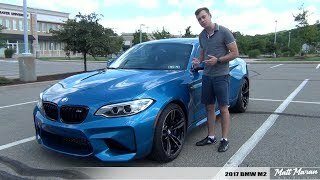 With this power rolling the wheels the top speed of BMW M2 2016 touches the mark of 155 mph while the 0-60 mph sprint can be knocked in just 4.2 seconds with DKG transmission while with manual it take 0.2 seconds extra.